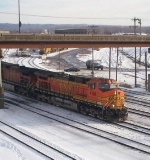 Description: BNSF Eastbound Doublestack Train at La Crosse, Wi. Title: Watch out, this shot is rated PG! Don't look if you can't handle it! Description: You may begin the uncontrollable laughter right about....NOW! Description: The BNSF 4184 leads an autorack train through a serene setting west of Staples on a chilly April day. Description: Here BNSF 4184 curves around Palmer Lake, Can you See the Fellow Railfan? 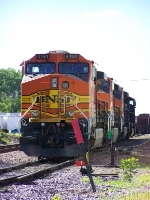 Description: X-MNSSTL strolls into the BNSF North La Crosse yard. 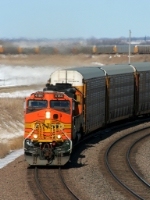 Description: BNSF Eastbound Grain Train X- MNSNSL rumbles through Onalaska, Wi. Description: Assorted Power including several warbonnets, some SD75M's, and a lonely ex-ATSF GE B23-7. Description: Five units blast up a slight hill and under the US 10 overpass west of New York Mills with a lengthy stack train. Description: A long Z train makes its way east after a long trip from the west. Description: Eastbound stacktrain heads towards the small town of Baring MO. Description: A trio of BNSF C44-9Ws; 4184, 791, and 4467; head east with a manifest. Description: The eastbound Manifest lead by BNSF 4184 meets yonger sibling 7887 and her stack train. Description: BNSF 5110 has the Z CHIPHX1 06A down to 55 MPH as it snakes its way through the Matfield Green area. Description: Six big GEs are waiting for a southbound unit coal train to clear the Tower 55 interlocker before moving north.